Who's your favorite JAWS character? It's back as of 11/7/97! Discuss JAWS, Spielberg, movies, etc. Cast, crew, and sequel information, as well as frequently asked questions. Images, sounds, video clips, a windows 95 theme, and a multimedia version of the JAWS script. Articles and reviews, from both professional and amateur critics. Film memorabilia, trivia, humor and a quiz for any JAWS fan. 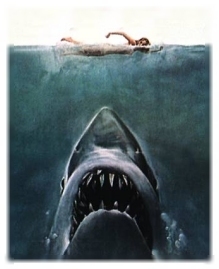 Links to web sites covering JAWS, Steven Spielberg, movies, and sharks. This Reel Ring site is owned by Jake Gove.